If you’re wondering whether silver has finally bottomed, just hang on because in a minute, we’re going to outline the 3-essential criteria points that will determine if this is going to be the case or not. 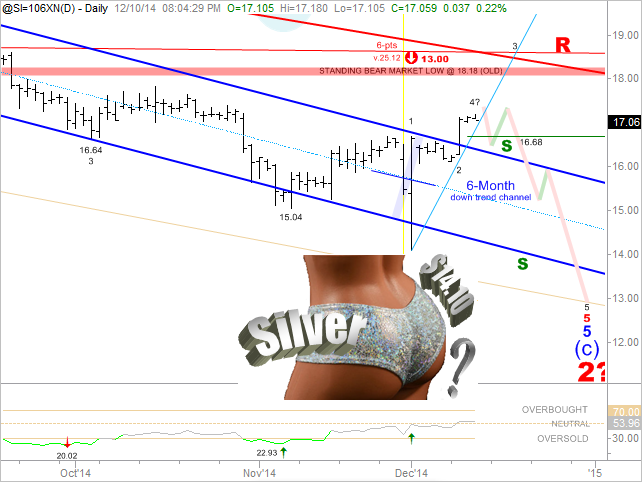 Is $14.10 all she wrote for silver bears? Technically, we cannot yet confirm this; however, I must admit that this particular bottom does appear rather alluring. Don’t get your shorts all twisted in a bunch just yet people. Remember, you don’t want to fall prey to every pretty-looking bottom that comes along now, do you? Damn, that is a super nice looking bottom though, isn't it? How can we know for sure? What if this truly were “the bottom,” the one we've been waiting for so desperately? Listen, I am fully aware that there are an awful lot of aloof stackers out there who just assume ignore charts and paper prices. Their thinking, and to a certain extent rightly so, is that the paper price is rigged so why bother – just keep exchanging worthless paper for a real tangible asset and forget about it. In a future article, I shall endeavor to reveal that at the end of the day, whether you like it or not – rigged or otherwise – that the paper-price of everything, which includes silver and gold – matters – to everyone. For now, with regard to paper-prices and rigging, let’s just set all such aloofness aside and ponder what it would take to confirm that $14.10 is indeed “the-bottom” that stackers have been longing for. Obviously, the $14.10 level must hold the print low. From and Elliott Wave Perspective, in order to maintain an impulsive price pattern, the $16.68 level should not be breached going forward. The current rally should extend to or beyond $19.26, and thereafter, the old bear market low of $18.18 should become rock solid support. If any one of the above criteria fails to hold muster, then lower lows remain plausible. After all, we must remember that we are still dealing with a long-term bear-market condition here. Until the price-action confirms by meeting all of the above criteria, a long-term bear market it shall remain – so don’t take profits on your long-term paper-shorts just yet.